#imbringingbirthdaysback is a movement started by Shannon West from Stampin' Up! 's corporate office. In January she was contemplating how she had neglected to send out her Christmas cards. She had noticed that many of her friends had posted Christmas cards on Facebook, just like they did with birthday cards. A handwritten card arriving in your mailbox was becoming obsolete. She resolved to change this situation. On Facebook she posted that she was going to send actual birthday cards to any of her friends that wanted one. Just tell her your birthday, and address and she'd send you a card this year. In a matter of 3 days, she had over 1300 people respond! A movement was begun! She told the people at Stampin' Up! about her story after she had hand carved herself a stamp #imbringingbirthdaysback. They loved it, created a stamp for sale, and the movement is catching on. Don't you love it! Won't your friends and family love to have a handmade card from you? Join us now! You will have the opportunity to stamp 12 cards with birthday themes (some will have other salutation options available). Two each of 6 designs. Envelopes included. The cost for this event is $20.00 Light snacks will be served. 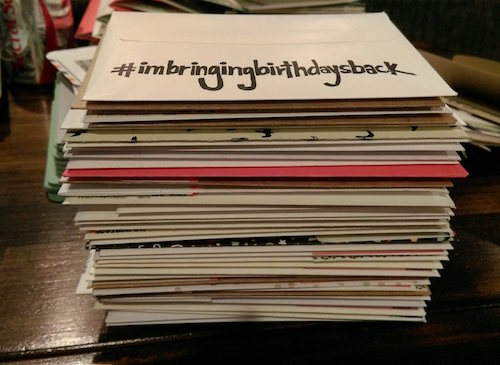 If you want your own #imbringingbirthdaysback stamp, I can order you one for $12. Grab a friend and come join the fun!! If you bring a friend that has never been to our class before, you will each get to make an extra special card!! In order for me to be prepared for you, I’m asking that you RSVP by Saturday, May 14. Let me know then if you want a stamp. If you have any questions please let me know.